The principal ingredient of the eggplant is moisture and a glucidic of 90 percent or more. It is not a lot about the vitamin group though contents of calcium, the iron content, and potassium are comparatively a lot of one. However, a juicy eggplant is the best for pickles. Especially, there is an effect that moisture decreases, vitamin B1 and potassium become twice or more when making it to the Rice bran pickle, it becomes delicious, and the nutrient increases. It doesn't contain a lot of things said that the eggplant is especially good in nourishment. However, excellent a lot of things in the function to adjust the living body are contained. In a word, a lot of polyphenols of anthocyanins such as the coloring matter, [nasunin], and [hiachin] of black purple of the skin of the eggplant (anthocyan) and antioxidants are contained. A lot of polyphenols are included in the red wine etc. , and there is working that lowers the cholesterol level and prevents arteriosclerosis. There is working that deletes the active oxygen generated in the inside of the body, too. In other elements, it is said that a lot of materials that prevent cancer are contained in the vegetable. Because the eggplant is a vegetable, a lot of elements that are other than moisture are dietary fibers. It is food effective as for the relief of constipation and the obesity prevention. If the eggplant is seen from the Chinese medicine, it becomes food that belongs to "Reason bloods" used to treat in the sickness concerning "Blood". The medicinal effect lowers heat in the inside of the body, and there is a hemostatic property to various hemorrhages. Moreover, there is a diuretic action. It is effective also in the swelling one. Moreover, it is classified into food that cools the body as well as the tomato. The person with a cold body notes the overeating. 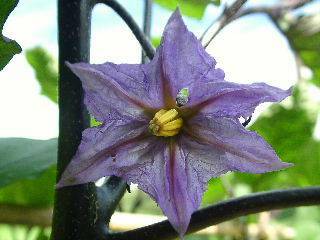 This photograph is eggplant flower. The eggplant does the color that purple drove fruits, the stalk, the leaf, and the flower. 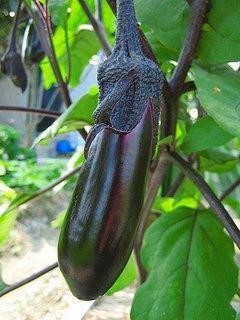 In the plant of the eggplant department, it is a feature that there are a lot of one including the alkaloid of the medicinal effect of the element of bitter and toxicity. The alkaloid includes the nicotine etc. of caffeine and the cigarette of tea and coffee. The eggplant was chiefly told from India of the country of origin to Europe as a medicinal use. The leaf of the wild vegetation of the eggplant department was made a narcotic, and the seed was used as a stimulus in the tropics. The eggplant was introduced to Japan via China at the Nara era. It has been used as a home remedy of the black combustion of the eggplant, the mix of the salt, use for the tooth polish, assumption as the prevention of pyorrhea alveolaris or taking away Ivo with printing the lower soup of the eggplant in Japan. The eggplant is not significant for the element to have been lost by heating it even with good a lot of nutritional contents for the body in the life. It doesn't fry in oil a heat resistant nutritional content is to abound even if the eggplant applies heat however, it boils, and there are so many problems even if combustion [taritoitta] is cooked. Because the flesh with a soft eggplant absorbs a lot of oil, the antioxidative potency improves further when stir-frying with the vegetable oil with abundant vitamins E etc. and it is convenient. I love oil stir-frying of the eggplant. It can eat the eggplant delicious even if it burns. It burns with the toaster oven etc. , the skin is peeled off, and it eats with the soy sauce and the vinegar miso. As for the skin of the combustion eggplant, you cannot badly eat the texture of each skin though you should eat each your skin if the effect of [nasunin] is expected. About the interpretation of "Do not allow the bride to eat the eggplant in autumn"
The bride is not allowed to eat because it is bad for the body getting pregnant from "The eggplant cools the body". The bride who gives birth to her heir is not allowed to eat from "In a word, the descendant becomes extinct in there is no child kind because it is a vegetable with few seeds". A hateful bride is not allowed to eat from "It is wasteful to make them eat because it is very delicious". Any theory can be consented. It is possible to think of three like bride and mother-in-law's fights. This bride also has the theory of indicating the rat. Because the eggplant is few the harsh taste and the seed and very delicious in autumn, do you like rats? It cuts in a size moderate in each skin and the salt sees to eat raw. Next, it exposes to water once and removal of harshness is done. It becomes very delicious when seasoning with vinegar, the soy sauce, and sugar after it often squeezes it. Because I was a farmer, it had made it for myself since childhood. I think that seasoning with the miso instead of the soy sauce is also good. I might be embarrassed with disposal it is not possible to eat because it catches the amount of throwing away in the farmer at the harvest time of the eggplant. In this case, I think that you should make the eggplant pickles. It salts once, and it makes to the Rice bran pickle afterwards, it makes to the mustard pickle, it soaks to sake lees, and it makes it to the miso pickle. It boiled, it stir-fried, and it burnt, and anyway, it took and it processed to various , and it ate to eat on the evening of daytime in the morning eating the eggplant from summer to autumn by the life because of the amount the eggplant of my home so that it was not possible to eat. Still, it never got tired. A large amount of tomatoes and cucumbers can be caught at a simultaneous period. Only in the vegetable, the vegetable-based diet is this. The eggplant is food that cools the body. Then, it has been done to cook by using ginger and garlic at the same time for the eggplant from of old. Because ginger and garlic had working that warmed the body, it might have been convenient. Delicious increases by adding to the eggplant.